« Electrolux & Kelly Ripa Host “Splits For a Cause” ~ Support Ovarian Cancer Research & Win Prizes! Tired of all the flashing screens, shrieking noises and obnoxious voices from your children's toys and wish you had simpler options? Want to feed your children organic food and drink? Need a one-stop shop for your breastfeeding supplies or eco-friendly baby products? Ever wanted to try organic makeup? These are all areas where EcoMom.com can help! They are a company whose philosophy centers around all things natural and organic. 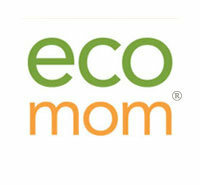 EcoMom wants to make eco-conscious living easy and affordable for everyone. I am always interested in "green" toys for Riley and they obliged by allowing me to review the PlanToys Click Clack Tree! EcoMom sent me the PlanToys Click Clack Tree, which retails for $45.00. Anytime I get the chance to give Riley a toy that is made from quality materials and doesn't require batteries, I'm a happy mom! This is why I was looking forward to seeing her reaction when I gave her the Click Clack Tree. 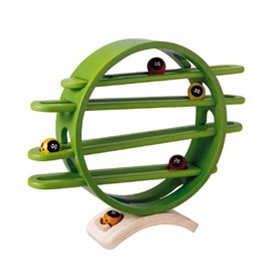 The idea of behind this toy is that it is a playground for the five ladybirds included. The ladybirds then click and clack as they travel down the tree to the base, where they stop. This toy requires a lot of imagination and can be a springboard for telling interesting stories about the ladybirds and why they're traveling down the tree. It can also serve as an aid for counting or even basic math. The Click Clack Tree is recommended for children ages 3 and up, since the ladybirds are small enough to fit in a child's mouth and become choking hazards. Riley is 20 months old and still occasionally puts objects in her mouth, so she is always closely supervised when playing with this toy. I was very impressed with the quality construction of the PlanToys Click Clack Tree from EcoMom. Assembly was very easy...simply attach two screws to the bottom to secure the trunk to the tree. The wood used seem very sturdy and of high quality. I also liked the two-tone bright green colors that the tree was painted. The little ladybirds were very colorful and interesting as well. The only part of this design that I didn't care for was the bottom of the tree. The stopper which keeps the ladybirds from rolling out all over the floor only allows for one ball and so the other four simply back up behind it into the tree. The balls are very hard to get out successfully and I wish that the base had been designed differently, so as to remove the balls quickly and easily. This way, you would be able to watch them roll over and over again and try to put them back in the tree as fast as you could without stopping to fumble and fidget with removing the balls from the ill-designed base of the tree. As you can see from the video above, Riley just couldn't stop watching the balls roll along the tracks and kept putting a new ladybird on the track again and again. She actually played with this toy, off and on, for the rest of the day. Even when she wasn't putting the ladybirds in their tree, she liked holding the ladybirds and even throwing and rolling them along the floor. So, if you're in the market for all things eco-friendly, including toys, makeup, baby products, food, drink, breastfeeding supplies, clothes, etc., then by all means, give EcoMom a try! I am very happy with the "green" toy I reviewed and am interested in trying their countertop composter next! Disclosure: I received the PlanToys Click Clack Tree from EcoMom in order to facilitate my review. No other compensation was received. This product review is based on my own personal experiences with this item and is completely honest and objective.